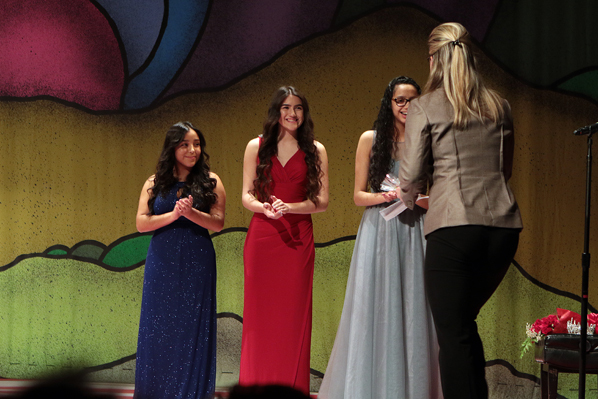 Introduced to the staff and students of Parkrose High School are Portland Rose Festival Princess candidates Gianella Velazquez, Kiara Johnson, and Rebecca Benitez. 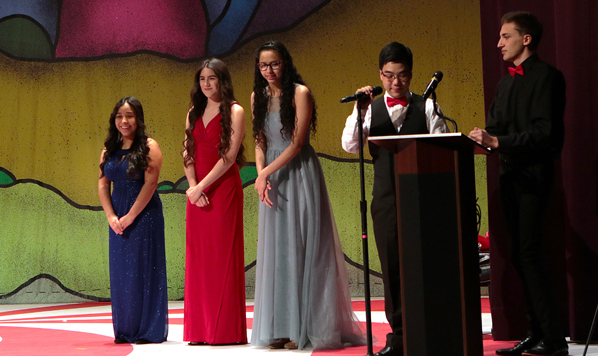 While the announcement of the 2018 Portland Rose Festival Princess may attract small crowds at some regional schools, that program at outer East Portland schools – including Parkrose High School, on March 22 – are always very well attended. Just after the last period’s bell rang for the day at Parkrose High, at 3:05 p.m., students and staff poured into the auditorium, filling nearly every seat. 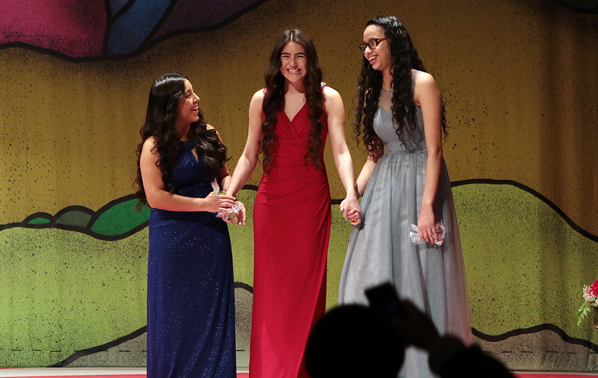 The program was simple; The program’s hosts announced, one at a time, the names of the three candidates, Gianella Velazquez, Kiara Johnson, and Rebecca Benitez. 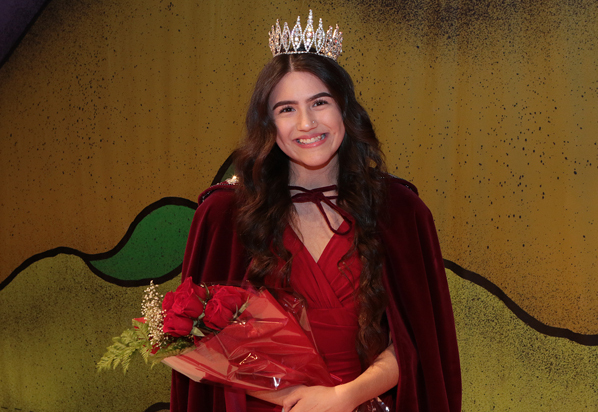 Speaking to this year’s candidates is 2017 Portland Rose Festival Parkrose High School Princess Mayranni Cervantes. 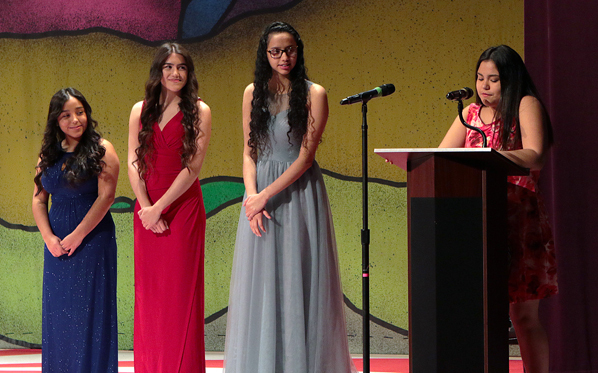 At the podium, 2017 Portland Rose Festival Parkrose High School Princess Mayranni Cervantes welcomed everyone to the program. Each of the candidates receives a gift from a Unitus Community Credit Union representative. The Unitus Community Credit Union “mentor” to the Parkrose Princess could not be present, but another executive from the financial institution said that Unitus staffer Karen Salman will be helping the new Parkrose Bronco Rose Court member; and then, gave each of the candidates a memento on Salman’s behalf. Kiara Johnson hears she’s the 2018 Portland Rose Festival Parkrose High Princess. The crowd continued to cheer as Princess Kiara received a bouquet of roses, was clothed in a royal robe, and received her tiara. Then joining the other two candidates, both worthy of the position, she and they posed for photographs for the media and the Portland Rose Festival Association. 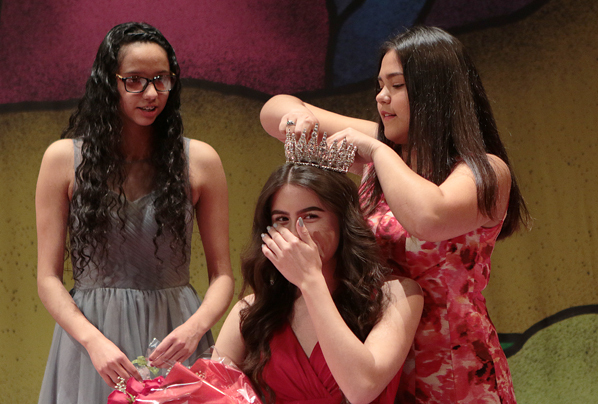 As 2017 Portland Rose Festival Parkrose High School Princess Mayranni Cervantes pins her tiara in place, Princess Kiara wipes away a tear of joy. “I’ve gone to Parkrose schools through my entire life; starting at Sacramento Elementary School, then to Parkrose Middle School, and now, I’ll be a graduating senior from Parkrose High School!” Princess Kiara told East Portland News. “I took the time and effort to do this because I thought it was a good opportunity for me to represent my school,” Princess Kiara said. “And, it will help me represent young women who are working hard doing as many things as I am, including working jobs, playing sports, and participating in other school activities. 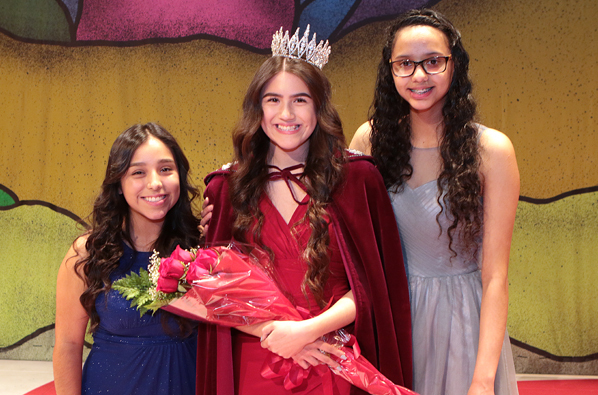 Introducing the 2018 Portland Rose Festival Parkrose High Court: Gianella Velazquez, Princess Kiara Johnson, and Gianella Velazquez. A friend of hers, 2017 Portland Rose Festival David Douglas High Princess Tiffany Nguyen, told her, if she were selected, “My best advice is just ‘be yourself’.” Princess Kiara revealed. Leaving her options open, Princess Kiara said she plans to pursue a career as a veterinarian or journalist. Her academic aspirations will be aided by a $3,500 scholarship provided by The Randall Group. Support Princess Kiara at the 2018 Queen’s Coronation in June! Cheer on Princess Kiara at the 2018 Queen’s Coronation on Saturday, June 9 at 8:30 a.m. just before the Grand Floral Walk at 9:30 a.m. and the Grand Floral Parade at 10 a.m. in Veterans Memorial Coliseum. For tickets, and all Portland Rose Festival information, see their official website: CLICK HERE.